We welcome to the team a new PhD student, Camilla, who will be starting her research on the pied babblers at the end of 2018. More details on her research to follow shortly. We have a number of pied babbler papers coming out in 2018, all of which we think present really important findings. For full details of authors and titles, please see the publications tab. First up is the paper by Nelson-Flower et al in Journal of Animal Ecology which tests prevailing hypotheses for the occurrence of cooperative breeding behaviour, and investigates the ecological and social contexts that influence dispersal decisions in pied babblers. Second is the paper by Nelson-Flower et al in Molecular Ecology that looks at factors influencing reproductive skew, and finds different drivers of skew in males versus females. Finally is the paper by Wiley & Ridley in Ecology & Evolution that looks at the pair bond as a predictor of reproductive success and group stability - a factor often overlooked in social species. All three of these papers used the long-term database to elucidate these behavioural trends - emphasising the value of long-term research! Our latest social research published in Nature! What a busy few years it has been! It is with much pride and respect that I am delighted to announce that the following students have now graduated as fully fledged Doctors! What an incredible achievement, well done to all for your impressive years of research, and we will miss you in the field! ​Our first paper on magpie cognition is now in press for Behavioral Ecology & Sociobiology! To view the paper, please click on the link in the publications tab. This paper is by Honours student (now PhD student) Mel Mirville, and looks at the relationship between group size and performance in an associative learning task. The paper reveals that group size affected neophobia, and hence likelihood to attempt the task. For those that attempted it, adults were much more successful at solving it than juveniles. Once an individual attempted the task, there was no effect of group size on whether the task was solved or not. Well done to Mel for her first paper! It's finally here! The BBC documentary series, the World's sneakiest animals, will air in the UK on BBC Two on christmas day. No word yet on when the international release will happen, but when I find out dates I will post it here. Here is the link to the documentary series website. If you click on Galleries, and then Behind the Scenes Gallery, pic 8 of 9 is the pied babbler study site. Fully funded PhD on pied babbler research available! The Behaviour 2015 conference in tropical Cairns has been and gone, and we had several group members giving talks there. Lizzie gave a talk about her PhD research into the effects of extreme heat on parental care strategies in pied babblers, Ben gave a talk about his PhD research into the effect of ontogeny on individual performance at a cognitive task in cooperative magpies, and Mandy gave a talk on the theoretical and empirical evidence for adaptive benefits of kidnapping in the pied babbler. Congrats to all group members for giving great talks at the conference! We welcome Kate Morgan to the group. Kate has taken up a postdoc on the cooperative magpies based in Perth. Kate's background is in cognition and behaviour, and her previous position was as a postdoc in Sue Healy's group in St Andrews, Scotland. Kate will be a great addition to the research group, and we will post further details about her research (plus add a profile of her on the Researchers page) soon! Congratulations to Emily, who just had part of her Honours research accepted for publication! Emily did her Hons research on the cooperative magpie in Perth, in a population set up very similar to the pied babblers. This Is Emily's first publication, and she is planning a further publication from her Hons research. This paper will be part of a collection of papers in a special memorial issue of Ostrich to commemorate the life and achievements of our beloved colleague Prof Phil Hockey, who sadly passed away two years ago. PhD passed! Congrats to Oded! Huge congrats to Oded, who got his examiner reviews back today and passed his PhD with no corrections requested! Well done Dr Keynan, well deserved indeed. For further info on Oded's success, please refer to the Pied Babbler Facebook page, as that page is updated more regularly. Oded currenty has a number of ms in review, so we will update any of his future success here or on the Facebook page. It has been a long, hot breeding season, and the rains have come late this year. Finally though, they did come! And now the desert is blooming, with a welcome glut of food for the hungry animals on the reserve. Unfortunately, the rain did not come early enough for another round of breeding attempts before the end of the summer season, so it looks like we have all the babies that we will have this season. A fairly low number of fledglings this year, but still better than some years we have had (still counting the small blessings!). Phew: we were offline for a while there! A bug in the system meant that I was unable to update the website. Just a reminder to click on the Facebook icon at the top right hand side of the webpage to go to our Facebook page, where our updates are more regular. The news for this month: huge congratulations to Alex Thompson, who was recently awarded the Science Faculty PhD medal and the Joseph Arenow Prize from the University of Cape Town for his outstanding PhD thesis on parent-offspring conflict in pied babblers. Congratulations to Alex for this well-deserved recognition! Congratulations to Oded for submitting his PhD thesis! Oded completed his PhD thesis on individual and group dynamics in the cooperative breeding Arabian babbler. Oded has worked incredibly hard, and has produced a thesis to be proud of. Each thesis submitted represents a huge amount of work by the student, and a lot of love and support from friends and family. Oded and his family are returning back home soon, and they will be sorely missed from the friends they leave behind here in Perth. Congrats to Oded Keynan on getting his first paper from his PhD research accepted! Oded's research on free-living, habituated groups of Arabian babblers looks at the acquisition of novel foraging skills, and the causes of variation in this among group members. Oded used experimental cognitive trials to investigate the causes of variation in the acquisition of a novel foraging skill. His paper was accepted today in Behavioral Ecology. TItle: Social foraging strategies and acquisition of a novel foraging skill in a cooperative breeder. By Keynan, O, Ridley, A.R. & Lotem, A. Well done to Oded on a great job, and we look forward to more papers from his exciting PhD research! To the left is a pic of an Arabian babbler flipping lids to access a food reward on the experimental array that Oded used for his research (picture courtesy of Yitzchak Ben Mocha). First babies of the new breeding season! The first babbler babies of the season have arrived! This is super-early in the breeding season for the babblers, but Lizzy has brought news from the field that RNB have already fledged two young. This is possibly the youngest ever fledglings for a breeding season. Babbler research on UK quiz show QI! The UK quiz show, QI (hosted by Stephen Fry), recently aired a show featuring one of our research questions! We are very excited by this type of media coverage in the public domain! Here is a link to the youTube clip of this show: the mention of babbler research kicks in at about 5 min 40 secs (and yes, that is one of our babbler pics that is featured in the background!). Great news coverage for the drongo-babbler article in Science! Seeking a research assistant to help conduct fieldwork on the Southern Pied Babbler population, based in the Kalahari Desert, South Africa. Applicants with a BSc in biology, ecology or zoology and with an interest in behavioural ecology are preferred. The assistant will be involved in data collection, under the supervision of a PhD student and the Chief Project Investigator, Assoc Prof Mandy Ridley. Applicants should be available from August 2014, ideally until April 2015. This is negotiable but a minimum commitment of 6 months is preferred because of the amount of training required. Work will include behavioural observations, sound recordings, GPS tracking, weighing of individuals, habituation and assistance with playback and presentation experiments. Accommodation, food and a small stipend will be provided. Previous fieldwork experience, especially in Africa is desirable but not essential. The work will be challenging at times and also physically demanding, with early mornings, hot temperatures and tough terrain. Fieldwork hours are typically from dawn for 4-5 hours, and again for three hours in the late afternoon until nightfall. It is expected that you work five and a half days per week. Applicants must hold a current driving license (4WD experience preferred) and ringing experience would be advantageous. In contrast to last year, the summer rains arrived this year, and it has made such a dramatic change. The desert is green, flowers are blooming and more importantly, the babblers are breeding! There was a dry spell from Late Dec to mid-Jan, but then the heavens opened again. All the groups are busy building new nests, after most of them had already successfully raised a first clutch in Dec. Several of our groups failed on their first attempts, and so we are hoping this new rain will bring new recruits to their groups. All the adults are in extremely good condition, with high daily body mass measures, and good maintenance off body mass over the chick-rearing period. We welcome Rute and Robbie to the Babbler project. Both will be collecting data on pied babbler behaviour for several months over the summer breeding season and have done very will to learn the ropes so quickly. We are delighted to announce our recent grant success! We were recently awarded an ARC Discovery grant to investigate the relationship between sociality and cognitive ability in the cooperatively breeding Western Australian magpie. Amanda Ridley is the Principal investigator on the grant, and her co-investigators are Alex Thornton and Matt Bell. Warm congratulations to Alex Thompson and David Humphries. Both have now had their PhD theses examined and passed with flying colours: no corrections required for either of them! This is a remarkable achievement and well-deserved after three years of hard slog and dedicated research by them both. Keep your eyes out for chapters of their theses, which are (or already have been) submitted for publication to various journals. This seems like the appropriate time to acknowledge those hard-working field assistants that helped them both throughout the three years. Although there have been a number of people that have helped (too many to mention, but all greatly appreciated), special mention goes to Fiona Finch, who tirelessly helped both Dave and Alex over a three year period and worked wonderfully with the babblers. Also Adam Britton, who put a long summer field season in for Alex, and always did his fieldwork with a smile. We have recently had a paper accepted into Functional Ecology. In this paper we look at the interspecific interaction between pied babblers and the solitarily foraging scimitarbill. We find that scimitarbills, who not have a reliable vigilance system of their own, regularly follow babbler groups and eavesdrop on the predator information that babbler sentinels provide. By so doing, scimitarbills gain significant benefits - they spend less time vigilant, more time foraging, and can utilise a greater diversity of foraging habitats than when alone. Title: The ecological benefits of interceptive eavesdropping. Authors: Ridley, A.R., Wiley, E.M. & Thompson, A.M.
We have recently had a paper accepted into Animal Behaviour. In this paper we test the three hypotheses for the occurrence of begging behaviours when there are broodmates around: cooperative begging, competitive begging, or begging simply as an honest signal of hunger. We use experiments and observations to conclude that begging is simply an honest signal of need by chicks, with no evidence that broodmates try to outcompete one another with their begging calls in order to attract more food from parents. Title: The influence of siblings on begging behaviour. Authors: Thompson, A.M., Ridley, A.R., Hockey, P.A.R., Finch, F.M., Britton, A. & Raihani, N.J.
Two babbler PhD theses handed in! Congrats to Alex Thompson and Dave Humphries for handing in their PhD theses! So much hard work goes into every thesis, and we are so proud of both of them. Alex's thesis, on begging behaviour and parent-offspring conflict, was submitted at the University of Cape Town. Dave's thesis, on the mechansims and consequences of social recognition, was submitted at Macquarie University. We have recently had a paper accepted into Proceedings B. In this manuscript we test Zahavi's blackmail hypothesis, and find evidence that fledglings can manipulate adults into feeding them more by the threat of their own destruction. Fledglings achieve this by strategically begging in dangerous locations when adult feeding rate is low, promoting adults to feed them at a higher rate. This is one of the first empirical examples to provide evidence for Zahavi's blackmail hypothesis. Title: The influence of fledgling location on adult provisioning: a test of the blackmail hypothesis. Authors: Thompson, A.M., Raihani, N.J., Hockey, P.A.R., Britton, A., Finch, F. & Ridley, A.R. Another breeding season has ended, but the tragedy this season was that it never really started. It was a scorching summer in the Kalahari, but sadly for the animals, the rains never came. Day after day of searing heat, but no rain respite made it the worst ever breeding season for the pied babblers. With very little food around, most groups did not bother to make any breeding attempts after December (which was when the rains SHOULD have arrived). Currently, we have only eight fledglings in the entire population. More groups did fledge young, but these have since been predated. Seven of our groups have gone extinct, and with a harsh winter coming up, we expect more extinctions before the next breeding season starts. While this is a very sad event for us all at Babbler Project, on the bright side it is very interesting demographically, which helps us with the aims of our recent successful research grant! The youngest member of our research team! Kito came out with us several times when we were doing brief life history checks on some of our groups. Here he is pictured with MPOR, natal to the group Duty Free, but now the dominant female at STT. This group lost their helper and tried to raise a baby only as a pair during an extreme drought. No other group in the population was breeding. Surprisingly, they fledged one chick. They lost incredible amounts of body mass during this breeding attempt. Ultimately, their valiant efforts were for nought, with their small fledgling being predated at only one week old. Kito found these two hard-working parents fascinating, and enjoyed watching them. Because of Kito's small size (compared to other babbler researchers! ), the babblers are very relaxed around him. A new baby has been born to members of the babbler research community. Congratulations to Martha and Tom on the arrival of their beautiful baby girl Tess, a sister for Audrey. With the THIRD flood of the season, it is safe to say that the drought has truly broken at the Arabian Babbler Project. This is fantastic news, after many years of poor rain and low breeding success, this bodes well for a bumper breeding season in 2013. Fingers crossed! Pied Babbler Research Project is now on Facebook! To check out our now Facebook site, click here. Flash floods in the Arava! Finally some welcome rains have fallen at the Arabian Babbler study site! After a very poor and very dry breeding season, flash floods have hit the Arava. While these can be very dangerous in the short-term while they flow through the bone-dry river channels, they bring much needed water to a parched ecosystem, and are followed soon after by abundant germination. The picture to the right is a flash flood flowing along a wadi (river channel) that was previously completely dry. The big news from Lizzy is that there is a new kidnapping event in the population! This is EXTREMELY interesting for us. Kidnapping is a rare behaviour, but entirely unexpected, and happens far more often than we would have ever imagined. This kidnapping fits the profile: CMF, a very small group who have failed to raise their own young for one and a half years (and are therefore at high risk of extinction), have stolen one of SHA group's very young fledglings. They are looking after it as if it was their own. We will continue to monitor this intriguing relationship between kidnapper and kidnapee. It has been a delayed start of the breeding season this year, perhaps because of the continuing low temperatures, and our first babies of the season have only just arrived. Three large nestlings were ringed in the group Duty Free on Saturday the 10th. Interestingly , DTF were the first to breed last year as well. A further nine nests hatched onsite this weekend, so hopefully lots more babies coming soon! We have recently had a paper accepted to the journal Animal Behaviour. This paper tests the two different hypotheses of sentinel behaviour - cooperative vs selfish. We refute the hypothesis that sentinels are safe and selfish, by showing that (a) they are further from cover than foragers, (b) take longer to reach cover following an alarm call and (c) are more likely to be targeted for attack during a predator strike. The paper provides the first experimental evidence for the cooperative hypothesis of sentinel behaviour. Title: Is sentinel behaviour safe? An experimental investigation. Ridley, A.R., Nelson-Flower, M.J. & Thompson, A.M. Recent scholarship success means that I am excited to welcome two new PhD researchers to the group - Elizabeth Wiley and Ben Ashton. Both will be starting their PhDs next year, based at the University of Western Australia. A new baby has been born to members of the pied babbler research community! Congratulations to Krys and Neil on the birth of their beautiful baby son Arun. Lizzy reports the sad news that one of our oldest babblers, TMBY, has gone. TMBY had been the dominant male of group OSD for over nine years. He was of unknown age, since he was already the dominant male when I first began working with OSD in 2003. He was an incredibly successful male, having fathered many young that have since gone on to become dominant breeding individuals in other groups within the study population. TMBY was also extremely useful in the habituation process - being an unusually friendly dominant male the rest of the group followed his lead and responded very well to observer presence from very early on. TMBY will be sorely missed, but leaves an unforgettable bunch of charismatic offspring behind. We have had a new paper accepted for publication. 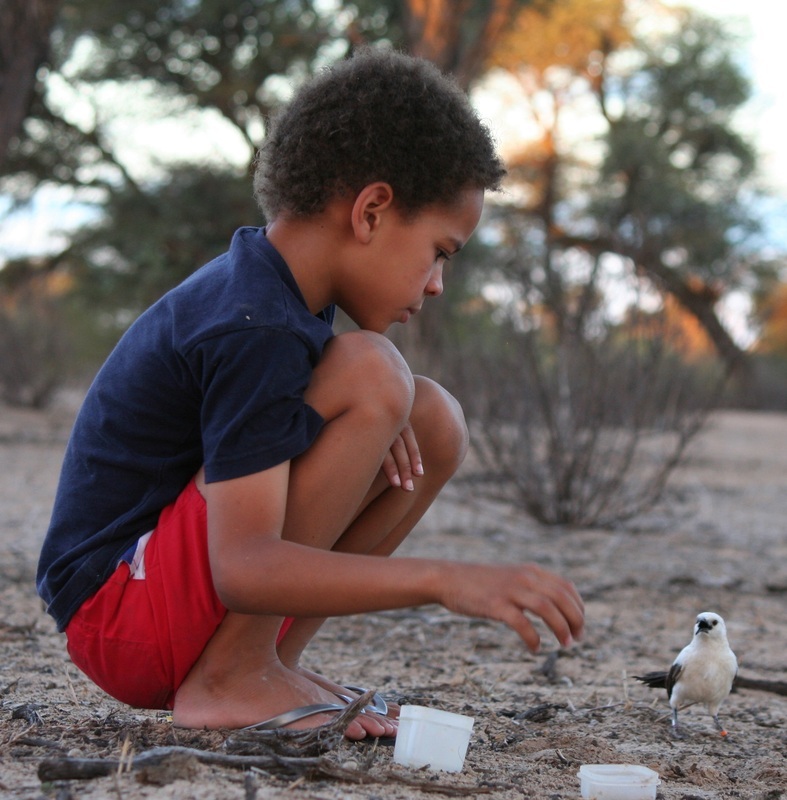 This paper, led by Alex Thompson, looks at the social foraging behaviour of fledglings. Alex found that fledglings do not just follow any adult to solicit food, but prefer to follow adults with high foraging success, since they are more likely to receive food from these adults. An experiment revealed that fledglings can change their social foraging behaviour very quickly following an artificial elevation in adult foraging success. This work suggests that fledglings monitor adults closely in order to maximise the benefits of social foraging behaviour. This research will be published in the journal Behavioral Ecology and Sociobiology. Congratulations to Alex on his first primary author publication! Title: Do fledglings choose wisely? An experimental investigation into social foraging behaviour. Thompson, A.M. & Ridley, A.R. The new breeding season begins! It is with sadness that I announce the loss of a matriarch to the population, BMBO. Originally from Rainbow (one of our first ever habituated groups), BMBO dispersed and founded her own group. Her dispersal record remains the furthest that we have ever recorded a babbler dispersing within our study population. She founded the group called Ngai Tahu, and remained dominant from the start of the group three years ago until her recent disappearance. She is succeeded by her three daughters, one of whom may take the dominant female position (she is unrelated to the current dominant male). Unfortunately, despite our high hopes, the drought in the Negev Desert resulted in a very poor breeding season for the Arabian babbler population. Although Oded recorded a surprising amount of breeding activity given the dry conditions, very few of these young survived long enough to recruit to the adult population. There are now only a handful of juveniles around from the season's breeding activity, who face the struggle of making it through a difficult winter with little food around. ISBE Lund 2012 is now over, and it was a great meeting. Well done to all babbler researchers, whose presentations and posters went really well and generated a good amount of interest among members of the Behavioural Ecology community. An update on a previous post regarding a new dominant female at XHOSA group: the new female turns out to be one of our old matriarchs - OMRY (now with only a numbered metal ring, hence the delay in positively identifying her). OMRY was born in SOX's group in 2005, dispersed to Infidels after her sister died while incubating a brood, and then struggled for several years with the dominant male (YMPY) to raise young as a pair. Last year OMRY left the population (replaced at Infidels by a new dominant female from Sundowners) and was found again several months later in a peripheral group in marginal habitat, where she succeeded in raising several broods. We are however delighted that she has now returned to the main population and we hope to be able to monitor her reign as the dominant female of a new group for many years to come. Locally extinct bird rediscovered at Arabian babbler study site! We have had two new papers accepted for publication. The first (published in Animal Behaviour) represents research done by Matt Child when he was my Hons student . This research looks at how differences in beak morphology between drongos and babblers may have catalysed the targeting of babblers by the kleptoparasitic drongo for food sources (subterranean prey) that they are unable to excavate themselves. The second, led by Dr Tom Flower, looks at the ecological economics of kleptoparasitism by the drongo, and suggests that the changes in ecological conditions that affect the profitability of kelptoparasitism may be the reason why drongos use this foraging strategy on a facultative basis (i.e. they forage for themselves when the benefits from kleptoparasitism are low, and vice versa). This manuscript is in press at the Journal of Animal Ecology. As mentioned in the "Photo gallery' page my research on drongos has wound down and is now being prinicipally lead by my collaborator Dr Tom Flower. For more info on Tom and his research, click here. Happily, the eminently skilled and experienced Elizabeth Wiley (aka Lizzy) will be rejoining the Pied Babbler Research Project this season as a senior research assistant. She will take primary responsibility of the research activities onsite for several months. Lizzy spent the entire summer onsite last season, and we are ecstatic that she is joining the research group again. To find out more about Lizzy, visit her profile on the 'Researchers' page. Following the drowning of CGMX, the dominant female from Xhosa group (XHO), she has been replaced by a wild female from outside our study population. This makes two new dominant females so far this winter season, and a lot of habituation work for us! Unfortunately, the death of all three fledglings from CGMX's last brood has also been confirmed, bringing Xhosa's group size down to four adults and two juveniles. Happily, after a slow start to the season due to dry conditions, breeding is now in full swing. Oded has reported that a number of groups are breeding - while some are still on eggs, others now have young fledglings. The 'miracle' brood of seven has unfortunately been reduced to one remaining fledgling - perhaps the sound of so many hungrily begging chicks attracted predators to the brood. Maybe this loss will promote the group to breed again and produce another enormous brood? Winter is always a tough time for the pied babblers - a time when group composition changes dramatically due not only to mortality, but also to reproductive conflict and dispersal attempts prior to the breeding season. Recently CGMX, the dominant female of Xhosa group, was found drowned in one of the dams at our study site. During the dry winter season the babblers are unfortunately drawn to these man-made dams in search of water. Her youngest brood is also missing, but we hope that they are found elsewhere. The dominant female of Catlaughers, TTOM, has been evicted (along with one of her offspring) by an unringed female who has now taken the dominant position. Tom (Flower) reports seeing TTOM and her young attempting to return to the group, but she was successfully chased away by the new dominant female. Surprisingly, the mortality count for the winter season has thus far been lower than expected. Seven chicks in one nest! Oded & Zach bring the exciting news of having recently ringed seven chicks in one nest!! Since typical brood size is 2-4 nestlings, this brood size is exceptional, and suggests that more than one female laid eggs. Oded reports seeing the dominant male mate with two females in the group. We look forward to finding out if all seven nestlings survive! With another group having recently fledged four young, it is great to see some breeding going on in a very dry year at Hatzeva. On the back of a dry summer with limited insect emergence, has come a very cold winter in the Kalahari. Tom, a research collaborator currently onsite working on drongo-babbler interactions, has reported that the babblers are suffering badly from the harsh combination of cold weather and limited food. Many are steadily losing weight, and at this rate we can expect that some of our juveniles will not make it through their first winter. Fingers crossed the toll will not be too high. Zach Teitel has recently arrived in Israel to join Oded in his research on the Arabian babblers. We welcome Zach to the research team - and the scorching hot Israeli summer! Congratulations to Sabrina Engesser, who will also be joining the pied babbler research team this breeding season. Sabrina won a PhD scholarship to Zurich University. We are delighted to have two new researchers join the pied babbler team (James & Sabrina), especially since Dave Humphries and Alex Thompson finished the fieldwork component of their PhDs this April! A new baby has been born to members of the pied babbler research community. Congratulations to Nichola and Dave on the birth of their son Joseph. Unfortunately this year both our research populations have been hit by drought. In South Africa the summer has now ended and after low rainfall over the rainy season pied babbler breeding success was very low. Several of our groups failed to raise any young. Our outstanding performers for the year were group Xhosa, who bucked the trend and managed to raise five young to independence. In Israel the breeding season is a few months in, and it is extremely dry (Oded reports only 7 mm of rain so far). Many groups are still not breeding and it does not look like a promising breeding season. Oded (currently in-field) brings happy news that one group currently has nestlings, and two groups have managed to fledge young - we'll cross our fingers that their fledglings manage to keep healthy. Well done to Oded Keynan, who has had remarkable scholarship success recently. Oded Keynan received a scholarship from the Arava-Australia research partnership, the Yair Goron Foundation for research in the Arava region, and the Hoopoe Foundation (from the Society for the Protection of Nature in Israel).